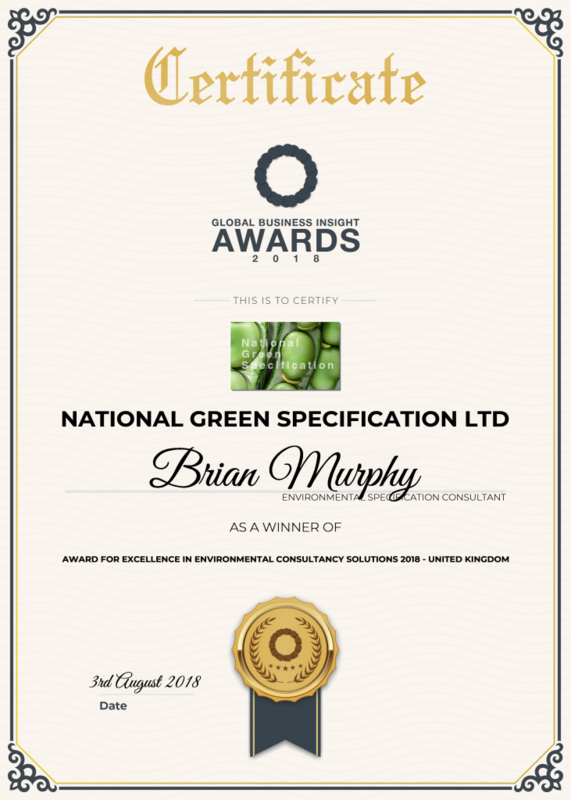 The 2018 Global Business Insight Awards celebrate business leadership, innovation in finance and investment and sector success across all seven continents of the world, and on behalf of GBI, I am delighted to tell you that National Green Specification Ltd has been selected as Award for excellence in Environmental Consultancy Solutions 2018 – United Kingdom. These annual awards are an exact illustration of the very best this essential and competitive industry has to offer. By concentrating on individuals, teams and organisations from a wealth of disciplines from CEOs to Young entrepreneurs, large corporations to sole traders, best procurement to best innovation and everything in between. Our awards endeavour to identify and celebrate those who fall within the Business Insight umbrella, whilst not forgetting the advisors who helped them get there! Please click here to view a detailed breakdown on our awards categories and criteria, that include Business, Finance, Investment, M&A, Women in Business & Finance and Technology. Using our far-reaching and intense research process, we ensure a selection of only the elite for our prestigious honours. Please click here to find out in detail, how we formulated the 2018 accolade list. GBI are proud of our position not to be pay-to-play, we equip all successful firms with the full copyright of their award title, along with a complimentary digital certificate.